It wasn't until very close to my day to play "Oh, Kaye" that I realized I'd be posting on Super Bowl Sunday. I admit, I'm not a huge football fan. Oh, I used to be, and Super Bowl Sunday parties were very much a part of my social life. But not so much these days. Learning that the NFL is a non-profit organization hasn't done much to help me love it again either. I am, however, a fan of food. And food is a big part of Super Bowl parties, right? So. I guess it's appropriate that I've chosen recipes as my topic of the day. These recipes aren't normal fare for football, but oh well. Football isn't really normal fare for what it once was either, so it seems. (tax exempt. really??). Any excuse to use these videos - Don't you love 'em?! Now that we've pretty well handled all the "All That Jazz," back to the cooking and baking . . . . This is probably where I should admit I'm not much of a cook. The type of cooking I do enjoy consists of tossing a lot of stuff into a pot, like soups, stews, chili, spaghetti - you get the idea. A little of this, a little of that - maybe a little more of this, etc. Nothing ever tastes like it did the last time, but still tastes pretty good - or so we hope. I seem to lack focus. Or something. I just feel the need to tweak; to add and/or subtract from the original. For this reason it strikes a lot of people (including myself) as odd that I love to bake as much as I do. You don't get to do a lot of tweaking while you're baking. Oh, you may get away with a little, but take that tweaking too far and you're gonna end up with a disaster on your hands sooner or later. Mother and I can attest to that as we threw away a very messy, expensive version of a Harvey Wallbanger Cake many years ago. WHY we felt this recipe needed more Galliano, I have no idea (especially since I remember drinking way too many Harvey Wallbangers watching a Super Bowl game a very long time ago). I have made it since, following the recipe to a "T" and it was delicious. There are a lot of recipes for it on-line, including one at allrecipes.com, if you're interested. But there is one recipe I love that I will fix for special occasions. It's pretty labor intensive, not to mention the "fat factor," but I love it. I remember running across this recipe at our friend John's house. He was always cooking wonderfully elegant meals, entertaining with ease and panache and I always just sat back and enjoyed the fruits of his labors. If there's one single thing I miss about living in Atlanta it would be John's parties. While John cooked and prepped for throwing the most perfect parties ever (from glam New Year's Eve parties to Super Bowl Parties), I would look through his stacks and stacks of cookbooks and Gourmet and Bon Appétit and scribble down recipes. Some I would actually try. One I did try and am still using is Joan Hackett's Country Pâté (I have recently seen this exact same recipe in a column written by a well known chef. Tacky old soul takes credit for creating it, even though he was nowhere on the scene back when this recipe first appeared). I've guarded this recipe with my life. I've made about a beezillion copies of it in case one (or 20) copies might get lost. It also now resides on my computer (in several places). Then, just to be "for sure, for sure," I bought a copy of an old cookbook which I learned had the recipe in it. THE BEST OF BON APPETIT published in 1979. 1979! See how long I've been guarding it? 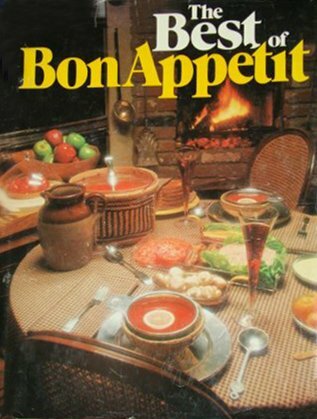 I was so happy to finally discover that it's actually in a cookbook. There's just something about having a cookbook open on my kitchen counter while I'm cooking. I find those food stains and splatters comforting for some odd reason. Put bay leaves in single layer in 9 x 5 inch loaf pan. Line length of pan with bacon; set aside. Half fill a large roasting pan with water and place in oven. Close oven door and preheat to 350. Melt 3 tablespoons butter in large skillet over medium-high heat. Add ½ cup parsley, green onion, onion, garlic and shallots and saute about 2 minutes. Remove to large bowl. Place sausage in large skillet; add 1/4 cup beer and cook over medium heat, mashing and turning with spatula, just until sausage starts to lose pink color but is only partially cooked. Stir in fennel. Remove from heat and add to parsley-onion mixture. In same skillet melt 1 tablespoon butter. Add veal and saute until partially cooked, about 2 minutes. Add 1/4 cup beer and cook 1 minute more. Remove from heat and add to bowl. Place chopped bacon in same skillet and saute about 2 minutes. Add stuffing and blend thoroughly. Stir in remaining 3/4 cup beer and cook 1 to 2 minutes more. Remove from heat and stir into onion-meat mixture. Add eggs, remaining ½ cup parsley and salt and pepper to taste; blend thoroughly. Mix in pistachio nuts (or leave them out if they don't appeal to you). Carefully pack mixture into loaf pan, pressing down firmly. Wrap entire pan in heavy duty foil (or doubled regular foil) as if wrapping a package. Place carefully in roasting pan and bake 1 hour. Very carefully remove from roaster and weight pâté for 3 to 4 hours by placing another loaf pan filled with heavy objects (such as books or canned goods) on top of a cookie sheet on top of wrapped pate loaf. 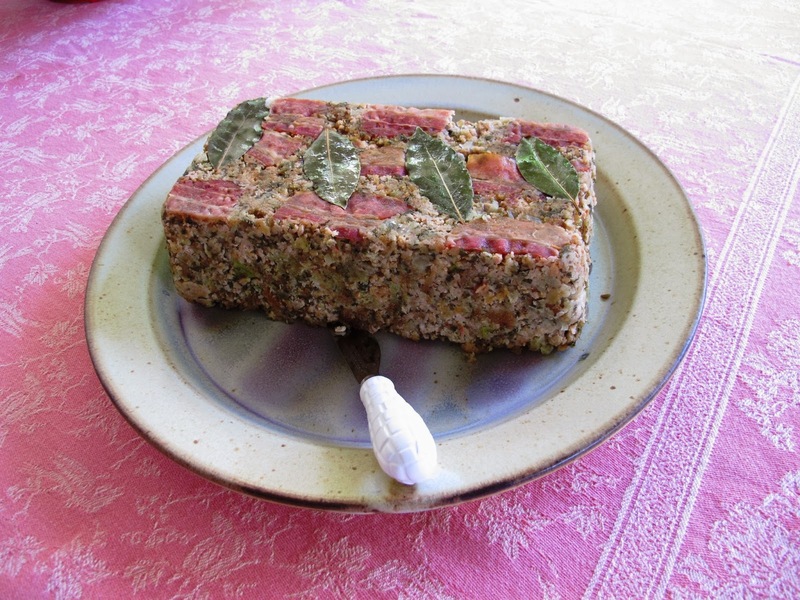 Remove weight and refrigerate pâté several hours or overnight. To serve, remove foil, loosen completely with knife and unmold onto serving plate. Pat off excess fat with paper towel. Grease torte pan carefully, flour. Beat 3 eggs on high speed till very foamy. Add 5 Tbsps. warm water while beating. Add 1 cup sugar - beat vigorously. Pour into pan and bake at 350 for 15 or 20 min., till top is lightly golden. Remove to cooling rack immediately. When completely cool, arrange fruits of your choice as desired. Use Dr.Oetker clear glaze over the top (found in the baking section of your local grocery). How 'bout you, Reds - do you have a favorite recipe you do for special occasions where you just forget about calories, fat, carbs and all that jazz? And, are you all watching the Super Bowl today? Your recipes sound delicious, Kaye! As for special recipes . . . where to start? How about my mother’s best-ever cheesecake? The original recipe calls for zwieback, but it is not always available. [Check the baby food aisle; Gerber makes zwieback toast for babies.] You can substitute graham crackers or chocolate wafers to make a crumb crust. Roll half a package of zwieback into crumbs. Mix with four tablespoons melted butter; press into 9 x 2 springform pan. Cream one pound cream cheese, one teaspoon vanilla. Add two tablespoons sugar, one-fourth teaspoon salt, four tablespoons sifted flour; cream until fluffy. Beat four egg yolks. Add to cheese mixture and beat thoroughly. Add one tablespoon lemon juice, one cup heavy cream; mix well. Beat four egg whites almost stiff; fold into cheese mixture. Add four tablespoons sugar; whip until stiff. Bake at 325 for ninety minutes; chill before removing from pan. Watching the Super Bowl would not be my choice of viewing fare, but we will be at my sister’s house, so I know that is what we will watch . . . .
My favorite Super Bowl recipe: Call the kids, and tell them to bring something to share. I'm alone while the wife travels, and have much work to do -- only watch the game as long as it's interesting. Ate so much ice cream yesterday I won't be cooking ANYthing, let alone fancy recipes. Will I ever grasp the concept of moderation? Sounds so fabulous… My plans are: go to YOUR house! Especially since I forgot I should cook something special… Oh dear. Oh the pate looks out of this world Kaye! And your cheesecake too Joan. "Oy" re: the Super Bowl - I could not have said it better, Kaye. LOVE those videos and the recipes! We're not celebrating Super Bowl Sunday (I try to watch the last 10 minutes of the game) but Chinese New Year here. We live in a 'changing to Asian' neighborhood and food has definitely experienced an uptick. Last night the restaurant was bustling and to start we had my favorite: juicy pork "soup dumplings" (xiao long bao) which I would never attempt to make and which must be eaten in the restaurant. I'll have the game on, but I'll be reading at the same time. I like Peyton Manning. I think everyone in Indiana is cheering for the Broncos because Peyton was here in Indianapolis for so long. (OK, how many of you heard of Peyton Manning?) But, first I'll watch the game that should be even more entertaining, the Kitten Bowl on the Hallmark Channel. No party. Just my cats, my books, and the TV as background. Joan - this sounds divine. Adding it to my Evernote right now! Hank - come on down! Actually, I know you'll come up with something delish and I can't wait to hear what it is. Hallie - I thought it was just me who would try to catch the last 10 or 15 minutes of the game! It's fun to see the victors, but it does make me sad for the losers too (what a weenie I am). Lesa - The Kitten Bowl!!! I have just this year heard about the Puppy Bowl for the first time, and now you're telling me there's a Kitten Bowl too. I love it! Enjoy your day everyone, whatever your plans. NFL is non-profit? Really? Maybe in the same sense that your yummy-sounding Country Pate recipe is low-fat. I'm sure it's a crowd-pleaser, Kaye, and plan steal to it for another occasion. For tonight's Super Bowl party I will be bringing crabmeat-tarragon bites in phyllo pastry. I confess I bought some of the little fluted phyllo shells, to save time. I don't have a team in the game, though the Broncos beat our Patriots a couple weeks back, so I suppose I will cheer for them on the theory that if you beat Tom Brady, you must be good. And Lesa, there's also a puppy bowl before the real game. Jack, I have a friend who's a Buddhist nun (no kidding) who says, "Everything in moderation, including moderation." Ooooh, Susan, I like this - "Everything in moderation, including moderation." I like it a lot. Kaye, I'm relieved you're tweaking, not twerking. Not planning on anything special to eat. Of course I have to root for Peyton since his daddy played for the Saints when I lived there. Oh, Kaye, LOVED the videos! And now I want to read Fosse. It is hovering just below freezing here, raining, possible ice. Staying home, maybe watching part of the game for the ads and the half time show (I don't think we'll get wardrobe malfunction from Bruno Mars!) --at least until Sherlock comes on. No company, as I'll be working today, too. Food--Superbowl Sunday comfort food. Deviled eggs, Lucy's Pimento Cheese recipe from Murder with Ganache, and my friend Diane's Baked Chicken Wings, with lots of carrot and celery sticks for the blue cheese dressing. Pat D., you made me spit! LOL!!! Twerking is nasty enough when a young chick does it. A woman of a certain age, like me, should stick to tweaking. LOL!!! Debs, I loved FOSSE. He doesn't sound like someone most of us would have "liked," but he was brilliant. I agree - Lucy's Pimento Cheese recipe is perfect for today's game. (and it is a TERRIFIC book!). Have fun, stay safe and warm, sweetie. LOL, Pat D! The first time, Kaye, that you said you were tweaking, for some insane reason my mind went to twerking, too. Now, twerking while cooking would be quite a feat. Hehehe! Kaye, the pate sounds and looks so delicious, but I fear I might be too lazy to fix it. Although, there are some labor intensive dishes I fix from time to time because of their deliciousness. Joan, that cheesecake has my mouth watering. Lucy, I agree with your hubby that chili is a great dish for today, and I might be making that. I don't get into the Super Bowl activities, and, like you, Hallie, I usually just watch the end of the game. Sometimes, I'll watch the half-time entertainment. The commercials are always interesting, but you can watch those on Youtube later. And, with the non-profit status of the NFL, I am even less inclined to watch professional football than before, which was almost never before. Kaye, thanks for another lively post this Sunday. I meant to say in the beginning that the videos were great. Your upbeat personality always shines through in your posts. Hmm. Maybe twerking isn't outside of your realm of possibility. Fun post, Kaye. Love the recipes. I will watch only the National Anthem, to be sung by the wonderful Renée Fleming. As is sometimes said here in Texas, I have no dog in the hunt for the Super Bowl. So, I will be celebrating the Chinese New Year with Shrimp Kung Pao this evening, while watching Downton Abbey and Sherlock. I've been watching some of the Kitten Bowl on Hallmark already today. Hallmark is showing it pretty much all day. The kitten names are almost as cute as the kittens themselves. So glad you enjoyed the videos, Kathy. I am a real push-over for show tunes and musicals, etc. Dancers are one of my favorite breed of people. I remember walking out of the theater after seeing Chorus Line the first time doing some high kicks and wishing I run away to NYC and be on stage. The Super Bowl commercials ARE fun, aren't they?! I think I've already seen them all on Facebook and have cried through more than one. Thank you so much for the triple blast of memory lane! Great songs and great choreography. He was crazy but he surely could dance! And Liza really hit it! oooh, Gail, I love Renee Fleming and look forward to seeing her also. AND, did I read that Grace Potter would be performing also? She knocks my socks off. Have signed the petition and hope many other do, thanks for including the link. What can you say that hasn't already been said about Liza? wow. I saw her perform at the Fox Theater in Atlanta and I remember thinking how magical she was. Just full of that special something that so few people have. More than charisma. I'm envious of anyone who can sing or dance! I will sign that petition re NFL's tax status. That is unbelievable! Kathy Reel, I will be reading your review of Rhys's latest on GoodReads today. I will watch the superbowl until Downton Abbey time. Hopefully will have seen Stephen Colbert's get cracking ad by then. I just wish to take this time to sendout a huge blessing of condolences for the children and life partner of Philip Seymour Hoffman, who was found dead today in his NYC apartment from a huge overdose of heroin! He was supposed to pickup his children today for a visit but never showed up. Let us sendout wishes to addicted people everywhere to get help, don't do what he did. Life is worth living if you just reach out to others. Our famous Falmouth French bakery is taking a 5 week winter break, so I stocked up on a few treats on my way home from church! Wallbanger in years:)) Forgot all about them! And, Have not made a pate for several years. May try this...thanks for sharing it. Debs on the Sound of Broken Glass. Life Lessons I may never learn. Good News...and a visit to India! What says I LOVE YOU in your house? Sharpen your penclls: Man walks his car . . .
Rhys flies by the seat of her pants.